A composition dedicated to Anish Kapoor. A large-scale sonic experiment, a concert designed to involve the public and performers in an architecture of meanings and structures: GARON (in Hebrew – “throat”) the brand new opera of Yuval Avital, an emerging talent of the international contemporary music scene, invited by Madeinart to dialogue with the space of the “Cathedral” of the Fabrbrica del Vapore (in Italian “the steam factory”) one of the city’s major arts venues located in the heart of Milan, created in a 19th century industrial complex: where the monumental installation Dirty Corner was on view. The concert is a co-production of MADEINART & Maga Global Arts, the Milan-based performing arts organization in which Avital is the Artistic director, and MilanoSonora. GARON is a real journey of listening with an exceptional overwhelming inedited orchestration: 40 tubas (ranging from contrabass Tubas to Euphoniums – the tenor tubas) are the foundation of this original sonic mass (in a stable orchestra usually only one tuba player is present), 6 percussions, 1 choir of 16 singers, 4 soloists of extended vocal techniques, 3 conductors, 1 programmer for the live electronics played in 12 speakers & one composer/director. 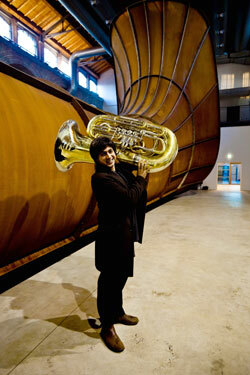 This is a one of a kind tribute both to the musical world of Avital and the archetipical and essential forms of Kapoor. 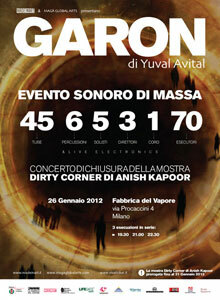 GARON is a musical composition of excellence that plays around the work Dirty Corner, a cor-ten steel tunnel 60 meters in length and 8 meters high, using as an ambient space for listening vibrant and evocative sounds. The encounter between the viewer and the music of Avital promises to revive an archaic world of communication and evoke far away cultural worlds. The power of the unconscious is intended to reverberate in an environment that will serve, not only as container, but as a provider of meaning and active resonance. It is the first time that a large scale formation of tubas is being used in contemporary music and, this important sonority suggests a form of sonic ritual closer in its aesthetics to Tibetan sacred music rather than to classic musical traditions. Viewer can delve as usual into the sculptural work, progressing gradually towards the darkness, but only for one time in a space made of electronic sounds, and three-dimensional polyhedra, in a kind of icon/sonic pilgrimage. 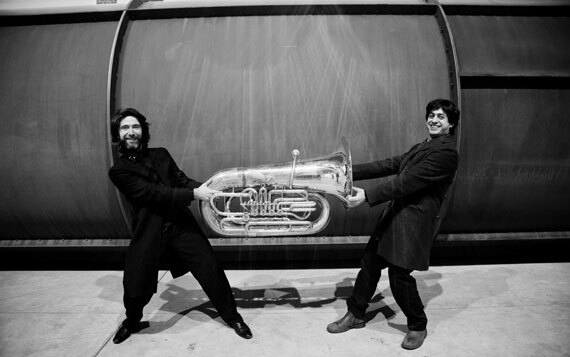 The tuba players united to perform this work by M° Eros Sabbatani, A Miraphone artist and one of the virtuosos of the instrument of Europe, will arrive in Milan from 9 Conservatories of Italy: from Giuseppe Verdi of Milan, Gaetano Donizetti in Bergamo, Guido Cantelli in Novara, Giuseppe Verdi in Turin, Santa Cecilia in Rome, Alfredo Casella of Aquila, Nino Rota of Monopoly, Vincenzo Bellini in Palermo and Angelo Corelli of Messina. The participation in GARON, of teachers and young students from such different realities, expresses a national Italian project which marks a milestone in musical sharing and networking. Yuval Avital and all the musicians has joined the initiative promoted by Anish Kapoor, Clifford Chance and Madeinart to support Banco alimentare Foundation Onlus (the Food Bank) that fights hunger in Italy. The concert lasted about 50 minutes and was repeated 3 times (7.30 p.m.; 9 p.m.; 10.30 p.m.).